“We still have a lot of work to do on our balance sheet,” Ford CFO Lewis Booth said today. NEW YORK (Bloomberg) -- Ford Motor Co. has to improve its balance sheet more before restoring common dividends that it canceled four years ago, Chief Financial Officer Lewis Booth said. Ford, which posted third-quarter net income of $1.69 billion, has made returning to an investment-grade credit rating a “rallying cry,” Booth has said. The automaker said that by today it will have paid down $10.8 billion in obligations in 2010, lowering its auto operations' debt to $22.8 billion compared with cash of $20.3 billion. Ford suspended its common dividend in 2006, one year after losing its investment-grade rating. A quarterly dividend of 5 cents a share may be paid in 2012, according to Bloomberg estimates based on data including the company's guidance, dividend history and regression analysis. Ford said earlier this week that its debt reduction efforts will save about $800 million annually in interest payments. That's the equivalent of “a pretty good car program,” Booth said in a speech at the Alexander Hamilton Awards, an annual event for treasury and finance executives in New York. By Friday, Ford will prepay the remaining $3.6 billion it owes to a union retiree health-care trust using cash, rather than issuing new stock. The company said its automotive operations' cash and debt levels will be equal this quarter, a year earlier than had been planned. Redesigned models such as the Taurus and Fusion sedans helped boost Ford's U.S. sales to a 21 percent increase this year, more than twice the industry-wide gain of 10 percent, according to Autodata Corp.
Moody's Investors Service said earlier this month it expects Ford to keep its rating for at least one year, which could be after Ford's contract talks with the United Auto Workers. Ford lost its investment-grade rating in 2005. 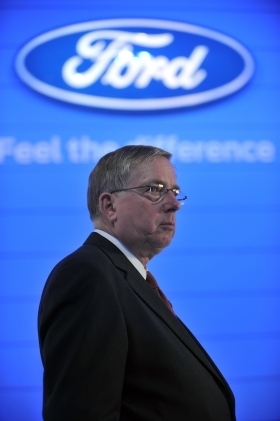 Ford is "close to being fully competitive" in labor costs and can achieve parity by hiring new workers under a two-tier wage system that the UAW agreed to in 2007, Booth said. The automaker's union workers receive about $55 an hour in pay and benefits, while foreign competitors' U.S. employees get about $50 an hour, Booth said today. Second-tier workers start at about half the compensation of hourly production workers hired previously. Moody's raised Ford's credit rating two levels on Oct. 8 to Ba2, two steps below investment grade. The automaker's operating performance “significantly exceeded” expectations, said Moody's, which has upgraded Ford five times in the past 14 months. S&P said after Ford released third-quarter earnings that results were consistent with its positive outlook on the automaker's B+ rating, four levels below investment grade. Speculative-grade debt is rated below Baa3 by Moody's and BBB- by Standard & Poor's.